Living in a metropolitan city you know at some point your neighborhood will be subject to road closures, traffic, and all the good/bad/ugly that comes with big events. If big crowds aren't your thing you might go as far away from home as possible when these festivities take place, or you might lock yourself up and binge on netflix and take out. So what will families choose to do when the city opens its arms to the annual Hardly Strictly Blue Grass Festival and Fleet Week/Blue Angels happening in just a few weeks? Enter Treasure Island and a group of boutique urban wineries often referred by the name Winemaker Studios (includes: The Winery SF, Vie, Sol Rouge, and Sottomarino). Together these wineries provide an escape for locals (and visitors), to drink award winning wines overlooking the Treasure Island Marina, Yerba Buena Island/Clipper Cove, and the beautiful architecture of the east side span of the Bay Bridge; on sunny days like we've recently been having the views can be stunning. 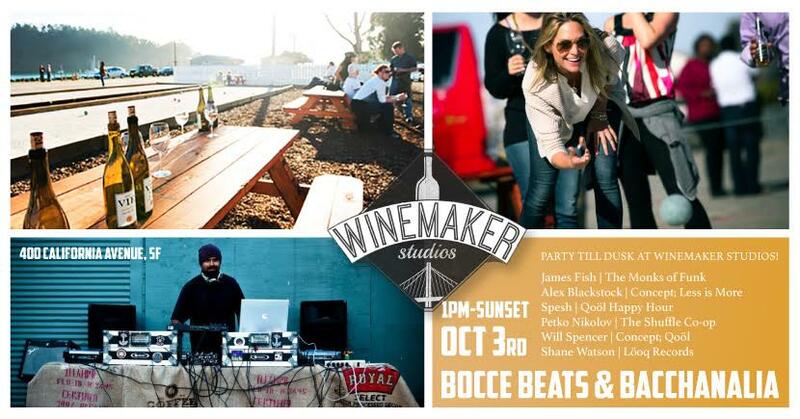 Below are two notable events in October that are taking place the same days as the Hardly Strictly Blue Grass Festival and the Blue Angels Air Show; but check their calendars (The Winery SF and Winemaker Studios) to see the line up of entertainment and wine happenings every weekend. Come visit The Winery SF and Winemaker Studios, it's the perfect destination for families to enjoy the weekend without all the bustling crowds or having to spend half the day traveling. From Golden Gate Park, the 8 mile drive can take around 18-35 minutes, depending on how early you make it out of the house.